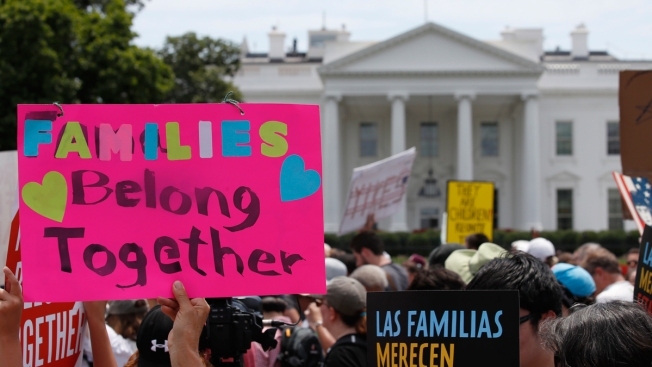 In this June 20, 2018, file photo, activists march past the White House to protest the Trump administration's approach to illegal border crossings and separation of children from immigrant parents in Washington. This spring, the Trump administration began a “zero tolerance” policy to criminally prosecute anyone caught crossing the border illegally. Because children can’t be in jail with their parents, more than 2,300 families caught by Border Patrol were separated. This spring, the Trump administration began a "zero tolerance" policy to criminally prosecute anyone caught crossing the border illegally. Because children can't be in jail with their parents, more than 2,300 families caught by Border Patrol were separated. 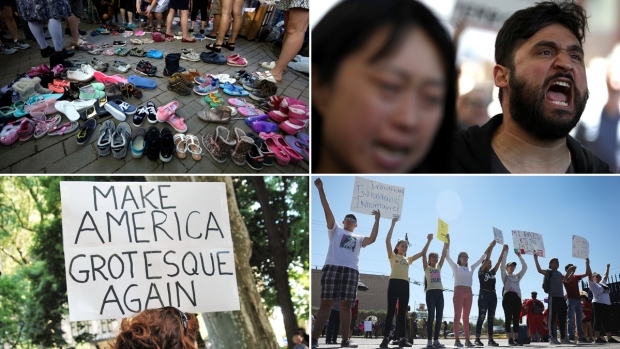 The move prompted mass outrage in the United States and internationally. After first blaming the practice on the Democrats, Trump on June 20 signed an executive order that stopped the separation of families. A June 26 court order by a federal judge set a hard deadline to reunite the families, and that deadline is fast approaching. It's still not clear how many children have been separated from families under the zero-tolerance policy, or how many remain separated. Trump administration officials have said 2,342 children were separated from 2,206 parents between May 5 and June 9. Trump's order stopped separations on June 20. About 520 children were reunited with their families within days because the improper-entry prosecutions were finished before the minors were turned over to the custody of Health and Human Services, which is responsible for caring for unaccompanied children. HHS Secretary Alex Azar told a congressional committee on June 26 there were 2,047 such children in his agency's care. On Thursday, he said there are somewhere "under 3,000" children who were believed to have been separated, but that includes kids who may have lost parents along the journey, not just parents who were detained at the border. He said none had been transferred to Immigration and Customs Enforcement custody yet. But it's still not clear yet how that will work. Homeland Security has set up a staging area at the Port Isabel detention center in Texas where the parents can be detained until their children arrive. But it's not clear where they will go afterward — the three operational family detention centers are near capacity. It's also possible not all parents will be reunited with their children; HHS has a strict set of guidelines the agency must follow to determine a suitable sponsor, including a home visit and a criminal background check. Health and Human Services deployed more than 200 workers to review the cases of separated children. Azar said parents and children are being swabbed for DNA to match paternity and checks are being done as rapidly as possible to make the court deadline. He suggested the children would be transferred to ICE custody at Port Isabel shortly before the deadline. But he signaled they'd ask a judge for more time. A judge rejected on Friday a Trump administration request for more time to reunite the children under 5 with their parents. 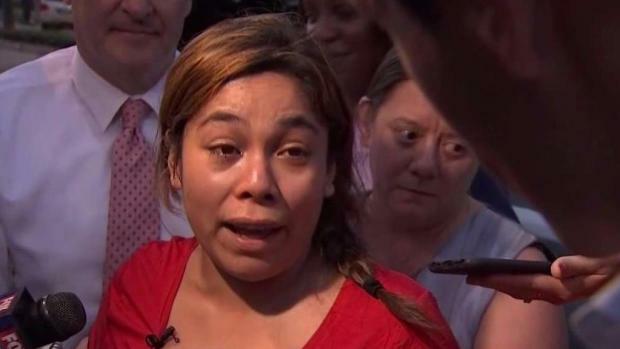 It's also unclear if the families, once reunited, will be detained together or released on bond to wait out their cases. Trump administration officials have signaled they want to detain families indefinitely if they cross the border illegally, regardless of whether they are claiming asylum, in part because they say the cases move much quicker. But a court agreement on how children are treated in immigration custody generally prevents the government from holding children in detention longer than 20 days. Justice Department officials have asked that the agreement, known as the Flores agreement, be modified to allow for longer detentions. Homeland Security requested up to 12,000 more beds for a family detention center at a military base, though it asked for 2,000 to be made available quickly and the rest as needed. The facilities would have to comply with the standards set by the agreement that governs how children are treated in custody, which include access to medical care, entertainment, counseling and air conditioning; though many who have been detained say the accommodations still feel like prison. Congress would have to approve funding to operate the facility. Attorney General Jeff Sessions, who oversees immigration courts, has narrowed the parameters for those seeking asylum, arguing that domestic violence or gang violence is not grounds to grant it — a blow to people arriving from Central American countries like El Salvador that have been ravaged by violent street gangs. Despite the limits, Homeland Security officials say if someone comes to a port of entry legally and claims asylum, then they won't face criminal prosecution for improper entry. They generally aren't detained while their cases are heard. Administration officials say only about 20 percent of asylum claims are granted, though people often spend years exhausting appeals before they are deported. Some asylum seekers have been turned away at border crossings. Administration officials said it was a temporary measure only to free up space in processing centers. They say that the migrants were told to come back and that it was not an effort to push them into illegally crossing between borders, where they would be more likely to be detained and face criminal prosecution. Meanwhile, the zero-tolerance policy remains in effect for those who illegally cross the border alone: About half of the illegal crossings are single adults. The charge of improper entry is a misdemeanor and the practice is usually for those caught to plead guilty and be sentenced to time served, or a brief jail sentence. Right now, adults who arrive with children are no longer being referred for prosecution because there is not enough space to detain families together. It's unclear if or whether families will again face criminal prosecution should space become available.